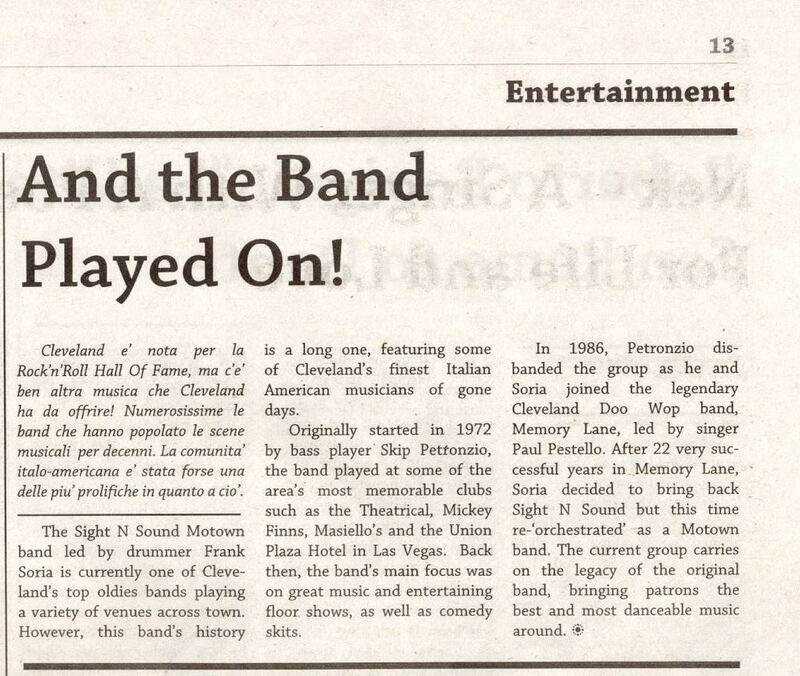 The Sight N Sound Motown band led by drummer Frank Soria is currently one of Cleveland’s top oldies bands playing a variety of venues across town. However, this band’s history is a long one, featuring some of Cleveland’s finest Italian American musicians of gone days. Originally started in 1972 by band player Skip Petronzio, the band played at some of the area’s most memorable clubs such as the Theatrical, Mickey Finns, Masiello’s and the Union Plaza Hotel in Las Vegas. Back then, the band’s main focus was on great music and entertaining floor shows, as well as comedy skits. In 1986 Petronzio disbanded the group as he and Soria joined the legendary Cleveland Doo Wop band, Memory Lane, led by singer Paul Pestello. After 22 very successful years in Memory Lane, Soria decided to bring back Sight N Sound but this time re-orchestrated as a Motown band. The current group carries on the legacy of the original band, bringing patrons the best and most danceable music around.